Any fans of Leslie Turners "Captain Easy" out there? 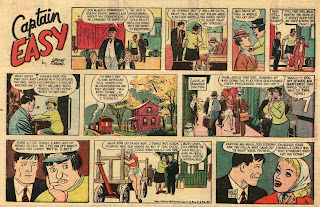 For years I've been aware of a sunday episode from the 50's about the cartoonist Wag Patakey trying to meet his deadline on his strip "Giddy McWaddle". 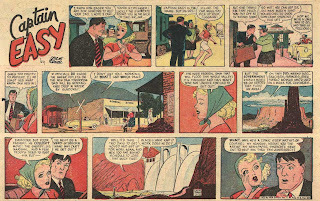 A character based on both Turner himself and his mentor Roy Crane. For all of you who hasn't seen it, I thought it would be unfair just to keep it for myself. So, beginning today and continuing next week here are Turners sundays from 3-15 to 4-26, 1953. Wonderfull !! You've done me a great favour. Thanks, and greetings from Haarlem, Holland.